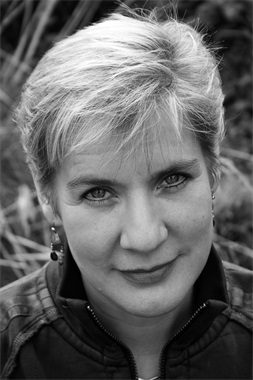 Today I'm over the moon to be finally welcoming Carnegie award winning author, Tanya Landman onto the blog. Tanya has come on to answer questions about her writing and her latest novel, Hell and High Water, which comes out in paperback next Wednesday. How do you feel now Hell and High Water is in paperback? Great! Every time a book comes out I feel an unbounded maternal pride. I would quite like to staple it to my forehead right now. Can you give me a one sentence pitch, to let my readers get a taste of what the book is about? Was it harder to write than Buffalo Soldier? I spent so long writing Buffalo Soldier that actually it was very hard to drag myself out of the American West and back to British shores. But its very much set where I live in North Devon, so I took a lot of long walks on the beach and cliffs to get myself in the mood. So are you a planner or pantser? Pantser. Much to everyone’s annoyance. I don’t like having to stick to a very detailed plan – sometimes the characters want to take off in a different direction and it’s important to give them their heads and see where they go. Sometimes they run into dead ends or disappear into blind alleys, but that’s all part of the process. It’s difficult! I do a lot of school visits and really love doing them, but performing and writing use very different parts of the brain. I have to block out stretches of time when I can concentrate solely on writing. I yearn for a shed. But I’m still writing in the place where I started – a corner of the kitchen. I complain about it endlessly, but it does seem to work for me! Do you have a daily word target? I aim to get 1000 words minimum done each writing day. If it’s going well I can get a lot more done. If it’s going badly squeezing out 1000 can feel like pulling your own teeth. There are so many! I could fill pages waxing lyrical about other writers. It’s a really exciting time in YA. I’m only going to mention one by name though – Mal Peet, who was (and is) an inspiration and a very good friend. Any tips on coping with rejection? It’s really tough and it doesn’t get any easier! A writer’s ego is a very fragile creature. The only thing to do is to keep going. Never give up. And while one book is doing the rounds of agents and/or publishers, get stuck into something else. The new characters will keep you occupied and distracted and that really does help. Do you know any SCBWI unpublished authors that we should look out for? If you’re with SCBWI you’re doing the right thing. I’ve got my eye on all of you. 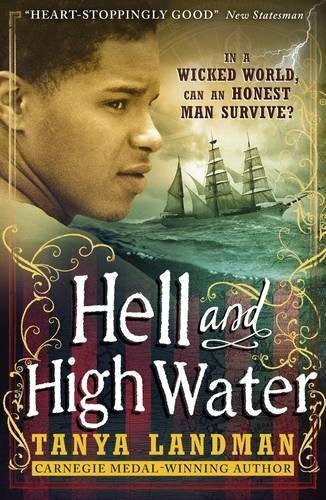 Hell and High Water is published in paperback on the 5th of May by Walker Books. You can pre-order it here with Book Depository. A heart-stopping tale of a young man's attempt to clear his father's name. When his father is arrested and transported to the Colonies, Caleb is left alone. After a desperate journey in search of an aunt he's never met he receives a strange, cold welcome. Then a body washes up on the nearby beach and Caleb is caught up in a terrifying net of lies and intrigue. Soon he and his new family are in mortal danger. This powerful story holds the reader in suspense as it charts the growth of a frightened boy into a brave young man.